This is my improvement to Walker Boh's NES "warpless" Rygar; I save 14169 frames (283.38s) for a final time of 15:43.32, again using the PAL ROM. One of the glitchiest games ever, now even more brokener! This run benefits from a wide variety of improvements. I use a different route which powers Rygar up in Lapis 1st, saving a lot of time in early boss battles. New shortcuts in Garloz, Sagila's cave, Garba and especially the Sky Castle saved a huge amount of time; some of these were made possible by new grapple weapon glitches. I die once to save a long trek in Garloz. I also used pause/unpause to manipulate (or eliminate) the projectiles fired by some bosses. No snails were harmed in the making of this run. The Sky Castle shortcut saves 100 seconds and is only possible in PAL. End of story. As far as I know, I discovered the grapple-release, floor-run, and wiggle-spawn glitches; the rest have appeared in previous runs, especially those by Walker Boh. Floor-run: grapple-falling or floating until stuck inside a floor allows Rygar to run with his head stuck in the floor. This is important because while running (as opposed to falling) in the floor, Rygar can still jump and use the grapple weapon. The run starts out identical to my warp glitch run. See those comments for details; the key is that when I kill that rolling enemy over and over again I'm actually spawning 4 of them on top of each other to rack up tone (weapon power) very quickly. Surprisingly, my calculations showed that the optimum amount of tone to accumulate here was the same for both runs. One minor change is that I start "attack and assail", which hits everything on the screen for ten swings, 2 hits earlier on the robots because only 5 hits are useful for Belzar. The Belzar fight is slower than in the previous run because I'm fighting him first instead of fifth, but the fight is very tightly optimized. I walk back and forth through him mostly for show. Unlike previous runs, I never jump once I'm near the sidescrolling bosses (except Ligar, where it's required to hit him) because Rygar's jumps are big and floaty and waste a lot of time above the boss' hitbox. I also get him to skip throwing one of his projectiles by pausing/unpausing for a few frames. I use this technique sparingly in the run as it is often necessary to pause for up to 16 frames to get the desired behavior, but it's invaluable, especially for Ligar. The levels are several seconds faster due to the one-hit smashiness of my powered-up diskarmor. The boss fight lasts only a handful of frames longer than it would take to run across the room. I jump while approaching Eruga because while in the air you can attack while still moving forward. Bad luck costs me a few frames having to take an extra jump and wait for a fireball while on the wind pulley. The shortcuts I take use both grapple-fall and grapple-release glitches discussed above. The first grapple-drop I do, where I float down across the pit first, may look slower than just jumping across the pit and climbing down normally, but it's not because then you have to climb all the way to the floor on the next screen, which is slower by maybe half a second. Sagila also goes down very quickly due to greatly increased tone. En route to Dorago I take a new shortcut across the grass to save a few seconds. Dorago's palace itself is lamentably unglitchy, but I did find a sweeeet way to abuse the spawning of those crawling doglike creatures (CDC's). Using the 'wiggle-spawn' up to five of them spawn on top of each other; they're worth 15 tone apiece and have very short invincibility which makes them ideal for tone accumulation. Alas, I only kill a few of them as I'm almost at full tone by this point, but if someone ever finds a way to reach Dorago's palace without the wind pulley and crossbow, this could be a big time-saver. Using attack and assail on Dorago allows me to score the first few hits earlier, with a net savings of about 1s. Because only 4 "attack and assail" hits are useful to save time, I start it earlier to save a few frames killing CDC's and trees. The Dorago fight is otherwise straightforward; dying afterwards saves about a minute of backtracking en route to Garba. Killing Dorago puts my hit power at 124 points/swing; the max is 127, but 124 kills all remaining enemies on my route with the minimal number of swings. I tested exhaustively for ways to use the grapple weapon glitches to speed the ascent up Gran Mountain to get up to the Tower. The efforts were unsuccessful, but did lead to the discovery of the "grapple release" glitch so useful for Sagila's Cave and Garba. Taking a speed boost from the falling bird is what allows me to jump off the second bird to save a rope climb, saving about 50 frames. My strategy in the tower is dramatically different from Walker's, because I don't need to kill the snails for tone and can use the grapple release glitch to ascend (killing the snails causes a rope to appear; trying to use the normal grapple fall-through-the-floor trick results in getting stuck in the ceiling). The part where I run with my head stuck in the ceiling (my favorite part of the run, btw) requires falling straight down with the grapple weapon until I stop. Attempting to move forward before "landing" gets me stuck in the ceiling in the "falling" rather than "running" state, which makes it impossible to throw the grapple weapon again to escape upwards later. The boss, DeathPigor is difficult to optimize because to kill him as close to the door as possible requires using grapple-release, air-walk, and air-float while delivering the last few hits. The first thing to mention here is that I save about 10 seconds climbing up the tower to get to the sky castle by repeatedly using grapple-fall rather than climbing all the way up as the current run does. The sky castle shortcut uses the same sort of glitch that allows taking shortcuts in Garloz. I found it using a low-tech version of bisqbot: set emulation speed to 800%, mash the d-pad and turbo buttons, and observe for unusual behavior. In doing so it emerged that the lower left corner of the castle has a small cleft (unlike in Dorago's palace, where the corners are squared off) which can be exploited to run directly to Ligar's lair, saving over a minute and a half. The power-up spell is useful for Ligar because it gives improved range, making it much easier to dodge his pizzas and still attack. However, manipulating the requisite triple-star proved impossible -- Rygar starts with zero mind points after dying. The same applies for attack and assail, which Walker's run uses; it would save about 2s, but there's no way to get the needed 5 mind points. The Ligar battle did benefit significantly from using pause-unpause to skip the occasional pizza delivery. For comparison among Ligar fights in the various runs, I look at the average interval between hits. Walker's was 33.8f/hit, with power-up and attack and assail cast; Cardboard's achieved 41f/hit without spells; my time is 31.9f/hit, also without spells. If one considers 30f/hit, Ligar's minimum invincibility time, the fight could theoretically be improved by about 61 frames...give it a try! Finally, I finish the game with one life point left; I didn't find a useful place to take more damage. Speed boosts in Rygar net up to 10 frames. 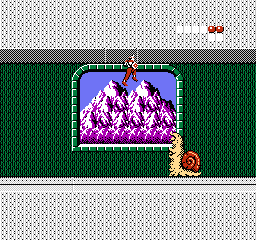 I mentioned above that no snails were killed in the making of this run, but I do go back after the run is finished, kill them all, and have a big escargot party. Oh, and I eat the dove from the ending, too. The run could benefit from better manipulation to get triple-stars and then use "attack and assail" to score the first hit on Eruga, Sagila and Ligar a bit earlier. As has been noted by previous Rygar TAS'ers, though, such manipulation is quite laborious, and total time savings would be a few seconds at most. A faster ascent to the Tower of Garba from Garloz would be awesome, but I convinced myself that it is impossible...prove me wrong! Truncated: Splendid. Accepting this improvement.